Every wholesale distributor faces increasing pressure to adopt a digital strategy for confronting massive disruption in the industry. Unfortunately, according to a recent survey by MDM, the approach most distributors take in developing an overall digital strategy is very reactive, with only 31% approaching their digital needs with a “comprehensive strategy that includes all types of software and solutions.” It’s time to think strategically about the technology that will determine the future of your enterprise. 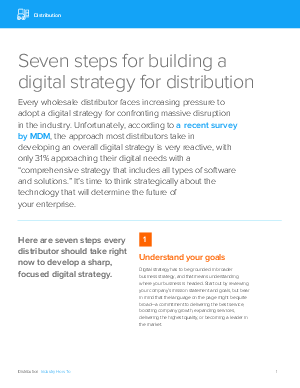 Download this whitepaper to find out the seven steps every distributor should take right now to develop a sharp, focused digital strategy.